Objective: Further to the previous post this is to install and configure the OpenStack's Image Service along with several concepts around it. This service provides REST API that enables us to query VM images metadata and retrieve an actual image. from the above diagram we see that one of the services is glance-api which accepts calls for image discovery, retrieval and storage. The second one is glance-registry which stores, process and retrieves the metadata like size, type and etc about the image. The third one is Database which stores image metadata, this could be any, but we would be choosing MySQL here. Using Glance you can even take snapshots of an image from an existing server for immediate storage. Use snapshots for backup and as templates to launch new servers. As mentioned, this a sequel to the previous post. We will now use the helper command openstack-db to create the image service database and tables in the mysql server along with creating a user called "glance" who will be using them. Following this we will now let KeyStone let the identitiy management system know that there is a service called Glance and create a user with that name "glance", and assign it the role of an admin and add it to the "service" tenant. Now registering the Image service with the Identity service so that other openstack services can locate it. Now for the moment of truth starting the Glance service. We can download an image, the lowest footprint one is the Cirros one. and now uploading this image to the Image service so that it can be used to create VMs with this OS installed. We are all set with Glance now. 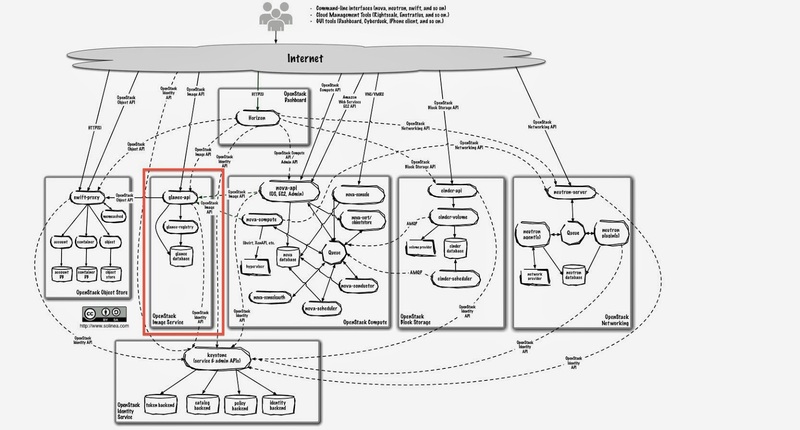 A digital representation of a person, system, or service that uses OpenStack cloud services. OpenStack Identity authentication services validate that an incoming request is being made by the user who claims to be making the call. Users have a login and may be assigned tokens to access resources. Users may be directly assigned to a particular tenant and behave as if they are contained in that tenant. Data that belongs to, is owned by, and generally only known by a user that the user can present to prove their identity. In the context OpenStack Identity, the act of confirming the identity of a user or the truth of a claim. OpenStack Identity confirms that an incoming request is being made by the user who claims to be making the call by validating a set of claims that the user is making. These claims are initially in the form of a set of credentials. After initial confirmation, OpenStack Identity issues the user a token, which the user can then provide to demonstrate that their identity has been authenticated when making subsequent requests. An arbitrary bit of text that is used to access resources. Each token has a scope that describes which resources are accessible with it. A token may be revoked at anytime and is valid for a finite duration. While OpenStack Identity supports token-based authentication in this release, the intention is for it to support additional protocols in the future. The intent is for it to be an integration service foremost, and not aspire to be a full-fledged identity store and management solution. A container used to group or isolate resources and/or identity objects. Depending on the service operator, a tenant can map to a customer, account, organization, or project. An OpenStack service, such as Compute (Nova), Object Storage (Swift), or Image Service (Glance). A service provides one or more endpoints through which users can access resources and perform operations. A network-accessible address, usually described by a URL, where a service may be accessed. If using an extension for templates, you can create an endpoint template, which represents the templates of all the consumable services that are available across the regions. A personality that a user assumes when performing a specific set of operations. A role includes a set of rights and privileges. A user assuming that role inherits those rights and privileges. In OpenStack Identity, a token that is issued to a user includes the list of roles that user can assume. Services that are being called by that user determine how they interpret the set of roles a user has and to which operations or resources each role grants access. It is up to individual services such as the Compute service and Image service to assign meaning to these roles. As far as the Identity service is concerned, a role is an arbitrary name assigned by the user. The OpenStack Identity API supports both the JSON and XML data serialization formats. The request format is specified using the Content-Type header and is required for operations that have a request body. The response format can be specified in requests using either the Accept header or adding an .xml or .jsonextension to the request URI. Note that it is possible for a response to be serialized using a format different from the request (see example below). If no response format is specified, JSON is the default. If conflicting formats are specified using both an Accept header and a query extension, the query extension takes precedence. 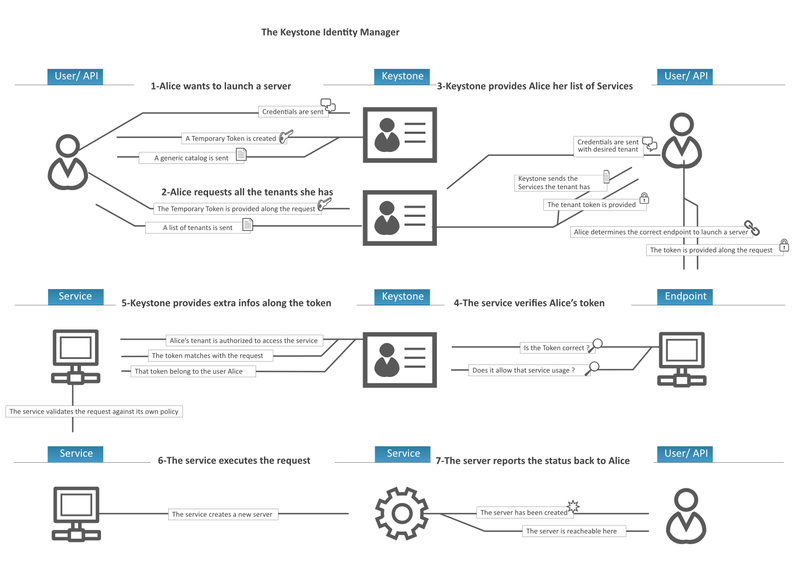 Below is a flow depicting the Authentication and Authorization flow using Keystone. As discussed in the previous post we are mainly focused on getting the user's perspective on the component. To be as close to a production environment as possible, we have chosen to have this running on CentOS. Setup Network service to start, set hostname, etc. Using the openstack-db command we will go ahead and create the database and tables we created in our previous session. We hit upon an error that is "ungoogleable", please see the end of this doc for some information on that. The identity service generates tokens which are cryptographically signed documents users and other services use for authentication. The tokens are signed using a private key while the public key is made available in an X509 certificate. The certificates and relevant configuration keys are automatically generated by the keystone-manage pki_setup command. These are used to allow access to services and endpoints. Now we will go ahead and create a role for the user. Since its for admin, we will go ahead and create an administrative tasks role called "admin". 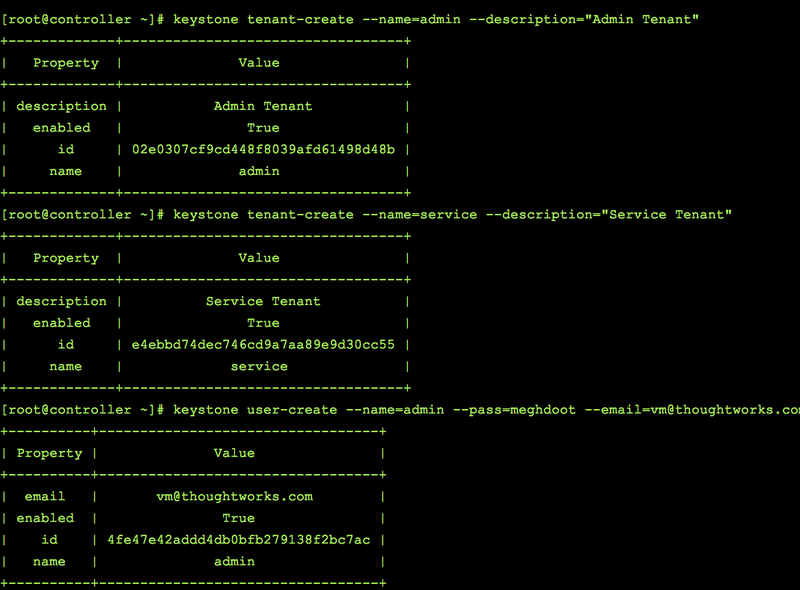 Now we will go ahead and add the user "admin to the role "admin" and tenant "admin"
The identity service can track which OpenStack services are installed and where they are located on the network. 2. Specifying an API endpoint for the Identity service by using the returned service ID from above.